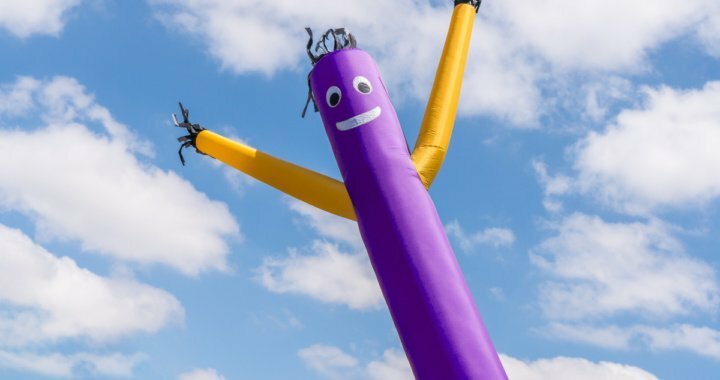 Dancing men, inflatable balloon dancers, flailing arm man, or wacky waving tube men – known by many names across the globe, they’ve become an unmissable staple of attention-grabbing, cost-effective advertising. If you are on the lookout for a low-cost tool for bringing traffic through your doors, the dancing men may be what you are after. Samson Hire has taken a deep dive into the history of the flailing arm man and offer some tips and tricks on how to best incorporate them into your advertising strategy. Quick – when’s the last time you spotted a dancing man? Chances are you’ll remember! Flailing men have a way of sticking in your mind even long after you’ve passed by. Chances are they made you smirk, if not grin – if not laugh! Their silly movements, bright colours and big smiles are disarming and goofy. If they didn’t make you visit the store they advertise outright, chances are you remembered it for longer than you would’ve if it didn’t sport an inflatable tube man. Why not stick in your customer’s mind through playful humour? Dancing men are such a memorable sight and seems like such a staple of used car lots and other shops that you may be surprised to learn that they were first invented in 1996 by an artist from Trinidad and Tobago for the winter Olympics. That’s right, one of the most effective advertising tools today started out only 23 years ago as art installations for the opening ceremony of the 1996 Lillehammer Olympics. Today flailing tube men can be spotted on lots and corners worldwide, with Houston being a notable exception due to their outlawing of the tube man in 2008. There are many businesses who can benefit from the flailing man, but perhaps best are large suburban car lots, discount stores, novelty stores, diners and large restaurants. Suburban businesses and inner city ones alike can both be well suited, as long as they’ve got sufficient space and are located near a large road. To improve the effectiveness, perhaps consider pairing the failing man with an advertising sign to provide more information on great deals and news. Use it to signal an exciting event! People everywhere love events, big sales, grand openings, and good deals. If you’ve got a big event coming up, investing in a flailing man to draw the eye of potential customers may be the perfect low-cost way to build anticipation in the leadup! Pair the flailing man with other advertising solutions such as Variable Message Signs and rooftop balloons! The only limit is your imagination, available space, and budget. They’re fun, they’re dorky, and used right they can be downright unexpected! Flailing men aren’t only for suburban stores offering especially good deals all year round. If you have the space for a flailing man and you’re closer to the city, using a flailing man can be the fun and quirky tool to advertise an upcoming event. If you are a store that most customers wouldn’t classically associate with attention-grabbing advertising tools such as flailing men, the surprising dissonance may just be the quirk that’s needed to draw the crowds to your next big event! Although not as strict as Houston, Melbourne too have a range of rules in place when it comes to street-facing advertising tools. These are in place to prevent unsafe advertising (such as being too close to a street, or positioned in a place where the flailing man may compete for attention from road signs, such as near a busy intersection. In order for your signage strategy to stay compliant it’s important to read up on advertisement rules in your area. Amongst advertising tools, flailing men are undoubtedly amongst the most cost-effective. That said, it can be hard knowing what’s the best option out of buying or hiring your equipment. Hiring is by far the best solution for short term advertising needs, such as event promotion, but even for more permanent advertising needs, hiring from a reputable signage company can be a cost-effective and reassuring solution. Samson Hire takes care of maintenance and helps with setup. Something goes wrong? We’ve got the knowhow to solve it. To learn more about our flailing man hire options, feel free to reach out to our team today!